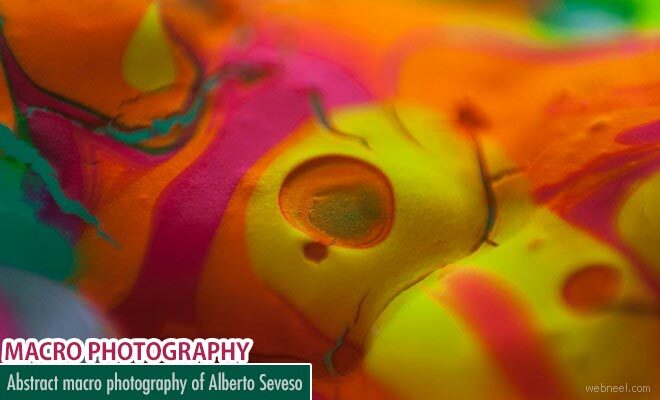 Macro Photography : Alberto Seveso is a freelance graphic artist born in Milan and curently working in Bristol, UK. His latest series of photographic exploration is "colour Depth" which is an observation of unseen world. This abstract series of photographs explains the depth of colour along with creativity. Digital artist Albreto's dispersion of colours and the macro photography is so lively. Seveso has created a name for himself as the pioneer of the ‘dispersion’ technique, a deconstructed rendering technique where he takes pictures of faces and bodies and blends them with vector patterns.He is now a featured artist of Adobe Photoshop and is his unique style can be found on the cover image he created for Adobe Photoshop CS6.